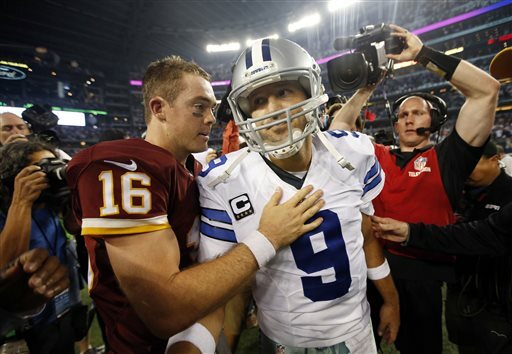 ARLINGTON, Texas (AP) — Colt McCoy did it again. The small-town West Texas kid calmly led a winning drive at the home of the Dallas Cowboys. McCoy’s successful return to his home state trumped Tony Romo’s dramatic return to the game. McCoy directed Washington to Kai Forbath’s 40-yard field goal in overtime and Dallas was unable to answer after Romo came back from an injury to his surgically repaired back, sending the Redskins to a 20-17 victory on Monday night that snapped the Cowboys’ six-game winning streak. Playing in Dallas’ stadium for the first time since his Texas-record 45th victory in the 2009 Big 12 championship game against Nebraska — 13-12 on a last-play field goal — McCoy won in his first NFL start in nearly three years after beginning the night with a career record of 6-15. It might be McCoy’s only start if Robert Griffin III is ready to return from a dislocated ankle that has sidelined him since Week 2. The Redskins go to Minnesota on Sunday, and then have their bye week. The Cowboys (6-2) had one last chance after Forbath’s kick, but didn’t get a first down. Romo’s final pass on fourth down was knocked away by Bashaud Breeland. Dallas running back DeMarco Murray extended the record he took from Jim Brown a week ago with his eighth straight 100-yard rushing game to start the season. He had 141 yards rushing and another 80 receiving, but also had his fifth fumble of the season at the end of a 36-yard screen pass inside the Washington 10 in the first half. Romo left after getting sacked by Keenan Robinson in the third quarter. He lay motionless for several minutes but returned for the final Dallas drive of regulation. The 34-year-old Romo, who had surgery for a herniated disk last December, reached for his back after the hit and stayed flat on the ground before trainers rolled him to his side. He walked to the locker room mostly under his own power. Coach Jason Garrett said X-rays were negative and Romo had a back contusion. Romo played through a back injury against the Redskins last year, leading a winning drive that kept the Cowboys’ playoff hopes alive. But he had to sit out a season-ending loss to Philadelphia that kept Dallas out of the postseason for the fourth straight year. This time, it was McCoy leading the Redskins (3-5) to their first NFC East win since beating Dallas with a playoff spot on the line in the 2012 finale. He took over for an ineffective Kirk Cousins at halftime last weekend and led a drive to Forbath’s game-winner on the final play of a 19-17 victory over Tennessee. The Redskins lost eight division games in a row — and their last seven games in prime time. McCoy, who was 25 of 30 for 299 yards, threw 23 yards to Pierre Garcon to get the winning drive going. On third-and-3 from midfield, he fled the pocket, pointed to Jordan Reed to run up the field and lofted a pass that Reed caught while tiptoeing inbounds. Another 16-yarder to Reed made Forbath’s job much easier. Brandon Weeden took over at quarterback after Romo was hurt, and his first play was a handoff to Murray for 51 yards to the Redskins 6, but the Cowboys had to settle for a field goal. McCoy put Washington up 17-10 early in the fourth quarter with a 7-yard run on a quarterback draw, slicing between three defenders across the goal line. Weeden answered with a matching 80-yard drive capped by his 25-yard scoring pass to Jason Witten. NOTES: Not only did Redskins RT Tyler Polumbus get replaced as the starter by Tom Compton, he wasn’t even active for the game. … Dallas LB Justin Durant sustained a season-ending torn arm muscle in the fourth quarter. … Redskins S Brandon Meriweather had two sacks, two forced fumbles and a fumble recovery. Racial Disparities in Early Childhood Ed Hurts U.S.